The first Yes studio album in a decade – 2011’s ‘Fly From Here’ – came under fire from various quarters. Since the core of the material first took shape in the early 80s, some (unfairly) lambasted the release for scraping the barrel for ideas, while others were less specific, wheeling out their beliefs that “no Jon Anderson = No Yes”. Neither short-sighted opinion held much water, since the album featured some of the best material the band had committed to record since the mid 90s, possibly even before. Benoit David did a great job vocalising both the new material and those ideas laid down by Trevor Horn and band some decades previously; Steve Howe sounded very comfortable in his role as guitarist – happy not to overplay his role (as he perhaps had done on some other Yes work) – while bandleader Chris Squire’s bass work appeared impeccable throughout. As with the often maligned ‘Drama’ of 1980 and the pop-oriented ‘90125’ from 1983, this more than showed that whatever the incarnation, there can be enjoyable results. With Yes being more of a flowing collective than a band with a traditionally rigid form, we never really know what’s around the corner and sadly, the ‘Fly From Here’ line-up of Squire, Howe, David, Geoff Downes and Alan White – was among the most short lived of all Yes line-ups. With Benoit David moving on and producer Trevor Horn stepping aside for Roy Thomas Baker, we wouldn’t get to witness how that group would fare on a follow up crafted (presumably) created from all brand-new soundscapes. Returning to the studio with Glass Hammer’s Jon Davison taking up the role of lead vocalist – an unenviable position given the attitude of some “fans” – the results on ‘Heaven & Earth’ could not be more different than most people expected. The shift in the band’s sound between ‘Fly From Here’ and ‘Heaven’ is more pronounced than the differences between any other sequential Yes releases before, save for perhaps the sideways step between 1974’s grandiose and stupidly ambitious ‘Relayer’ and the more song-oriented (and quite brilliant) ‘Going For The One’ in 1977. While not having anything much in common musically with either of those records – aside from being a Yes album – stylistically, that shift away from progressive complexities and towards simpler song-based material is echoed here. Firstly, its quickly evident that Davison’s voice is a good fit with Yes’ umpteenth re-birth, his high tenor and falsetto tones resting somewhere between Anderson and David. Replacing a vocalist is a tricky business – especially one as loved as Jon Anderson seems to be – but the band know Davison is up to the job and never try and push him aside by concentrating on overtly complex musical passages: indeed, quite the opposite, in fact. On most of the album’s opener, ‘Believe Again’ – a number written by Davison & Squire – its the vocal harmonies and melodies that leave the biggest impression, the musical side of Yes appearing somewhat sedate. Their softer mood is evident right from the off, with Howe’s echoing tones sounding more like a violin than electric guitar. A simple melody – light years away from the atonal and busy bonkersness that he is capable – leads the rest of the band into a surprisingly lengthy tune given the general musical approach. Fleshing out most of the harmonious musical side, Downes’s keys take on pompy chords, perhaps closer to Asia than most Yes from yesteryear, while Alan White is left to settle into a fairly basic backbeat. While there’s a hint of proggy indulgence during the middle instrumental break courtesy of some deep booming bass colliding with a typical Howe jazz-inflected solo, and Squire can also be heard teasing with some fairly typical bass flourishes during the coda , the bulk of this seven minute opener is sedate and very accessible. Making the most of a harmonious chorus throughout, ‘Believe Again’ shows off a very mature, streamlined sound – and it is one that gives most of the album its overriding mood. ‘The Game’ brings much more of the same. Across seven minutes, Davison cements his place within the Yes pantheon, his higher registers taking the reins. While there’s still a very AOR edge to the music, hints of earlier Yes creep in farther, with Howe asserting himself a touch more. Here, simple vibrato filled notes inform most of his lead work, while acoustic flourishes provide most of the verses’ musical backdrop. No matter how many lead guitar noodles appear though, none of the lines come as particularly surprising – its the kind of thing you’ve heard from Steve time and again throughout the decades – but, of course, he has nothing to prove. His jazzy tones provide the perfect foil for Squire’s tough bass sound throughout but, even so, both players sound more than content to let Davison be the one who really shines. Stepping out of the shadows, Downes leads ‘Step Beyond’s verses with a “marmite” keyboard sound that rattles away happily, its riff sounding like an old TV theme tune – equal parts sci-fi and seventies children’s TV. Far more flippant than either of the previous numbers, this appears rather throwaway at first, but subsequent listens uncover enjoyable features. Yet again, the band favours strong vocal arrangements, while Howe includes a few unexpected moments of heaviness within his riffing. One particularly brief riff echoes the aggressive nature of ‘Machine Messiah’, while a couple of rhythm guitar motifs seem to have more in common than Trevor Rabin than anything he’s laid down previously. The happy-go-lucky nature of this piece will either amuse or annoy, but the fusion of styles within make the best of Yes’ more streamlined musical skills – they seem content to settle for something that never requires any flashiness, but it works. The largely acoustic based ‘To Ascend’ is the album’s only genuine dud. The coming together of piano and acoustic guitar is pleasing at first – especially when glued together by Squire’s distinctive bass, but beyond that, it’s just drippy. Davison recycles a bunch of hippie-based Jon Anderson rubbish about seeing through the eyes of children and birds flying, while the band seem to get lost within a MOR swamp. It’s not as ridiculous as Jon Anderson’s ‘Circus of Heaven’ (from 1978’s ‘Tormato’), but this album could have done without it. ‘In a World of Our Own’ is unlike anything to appear on a Yes album before. Although carrying on the gentle approach of the preceding material, its marching beat – settling somewhere between ‘Penny Lane’ by The Beatles and many a 70s pop tune – is surprising. Although he never gets to play anything particularly striking, Squire’s fat bass sound remains distinctive wherever it rises, while Howe’s main contributions straddle prog rock and noodling jazzy pop whenever he’s called upon for a lead break. There are occasional threats to branch out into something more grandiose, usually whenever Downes throws in a huge Hammond organ chord, or the time signature fluctuates – as it does occasionally, this is still Yes after all – but ultimately adult pop wins out here…and in terms of such middle of the road pop, this is very pleasant indeed. A composition solely credited to new man Davison (presumably bought to the sessions in near complete form), ‘Light of the Ages’ at first appears to be another drip-fest akin to ‘To Ascend’, but luckily we’re spared another straight trip into sub-Anderson new-agism. Yes, the acoustic guitars are back; yes, he sings about the cosmos, and yes, there’s that title, but the musical elements make up for any slightness. Although too brief, Geoff Downes puts in a bigger appearance here than on most tracks courtesy of a quasi-classical piano moment; Howe’s high pitched soaring guitar motifs come closer than ever to bringing back memories of classic 70s Yes and Squire’s pumping bass – although preferring solidity and simplicity over showiness – brings a fantastically meaty sound. Although not always as enjoyable, in places, ‘It Was All We Know’ flirts with pop almost as much as ‘In a World of Our Own’. Another tight, mid-paced rhythm leads the way, while the harmony vocals possess a quality that’s closer to light musical theatre than the more typical Yes, but Howe’s lead guitar work ensures its always quickly evident this is a Yes recording. This is filler in almost every sense of the word; while never that bad, there’s nothing to latch onto – the lead guitar work is far better on ‘The Game’ and ‘Step Beyond’, the vocal harmonies far tighter and stronger on ‘Believe Again’ – even Squire appears to be happy just kicking back. 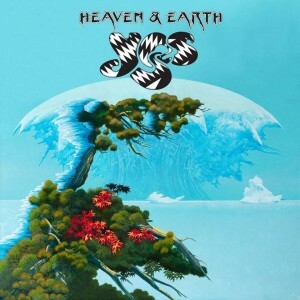 Those who constantly look for ‘Relayer’ and ‘Close To The Edge’ style indulgence when approaching a Yes album will hate most of ‘Heaven & Earth’ with a passion, but then, it was probably never really meant for those guys anyway. Love it or hate it, although there’s an all-round feeling of safety with ‘Heaven & Earth’, it doesn’t seem to retread too much (obvious) previously covered ground. Like ‘Open Your Eyes’, it’s very much Yes-lite, not seeking to push any real boundaries or challenge its audience. Calling out far more to any open-minded ears and the AOR/pomp fan as opposed to those who demand prog rock with a capital P, it’s an album that is enjoyable enough on its own merits. This entry was posted in Album & EP Reviews and tagged chris squire, classic rock, frontiers records, geoff downes, prog, steve howe, yes by Real Gone. Bookmark the permalink. I didn’t. I put “fans” in inverted comma’s (sic), to signify that when it comes to a version of Yes without Jon Anderson (or indeed some records that don’t sound like Yes from 1970-78), some people don’t behave like fans at all. Davison will be up the job until Squire wants him out, Probably will not have to wait too long. Your show in Albany at the egg was stellar!!!!! Totally enjoyed your opening act too! So….wanting the band to live up to its established standards of excellence makes you a “less open-minded” fan, while “not seeking to push any real boundaries or challenge its audience” (translation: being creatively lazy) is seen as a plus. Interesting. Close to the edge was as close to nirvana as anything Yes ever did. All the stuff after Relayer that was basically great pop music and was not for me. In today’s world of ever shrinking attention spans people don’t have the inclination to listen to an album like Close to the Edge. It really is a shame Just imagine how many of the greatest albums of all time would have gone in the dumper if they were produced today. I agree with Adam. Close to the Edge was the pinnacle of early Yes. Tales went just a bit too far but was wonderful nonetheless. After that we saw some pretty bleak years. I can’t agree that Going for the one was “brilliant”. It was good but comparatively poor next to the Yes Album, Fragile and Close to the Edge. I think later years have seen a musical renaissance of Yes. A different style but some great music – Big Generator, 90125, Talk and Union have some great pieces of music which I love but which I somehow think of as in a separate grouping to those early 70s albums. Nowadays I tend to follow Jon Anderson and Rick Wakeman musically. Thatis not to say I don’t wish the new Yes every success. These guys have given me such pleasure down the years. I am pleased they are still working touring and having fun. Love music Peace music War music – we move to it all. Relayer was “stupidly ambitious”? Where does this guy think the band’s fan base came from? Close to the Edge, Tales, Relayer and Going for the One raised them to virtuoso status. The only stupidly ambitious entity here is the author. You can’t argue it isn’t very, very ambitious though, can you? They pulled it off, of course, but early Yes was often about ambitious music. YES is now living on it’s past and each step during these declining years reduces the legacy that much more towards debased embarrassment. The new album is uninspired, lacking in energy and is not audibly recognizable as the group we’ve come to know as YES. I stopped reading at “stupidly ambitituous” Relayer. Your loss. Once again, Yes fans: “stupidly ambitious” WAS NOT a criticism.